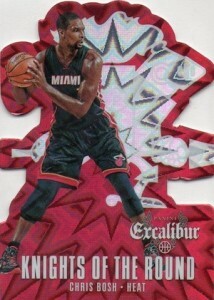 2014-15 Panini Excalibur Basketball caps the season as far as Target-exclusive products go for the sport. This is the third product offered only at the retail giant. Seemingly born out of the Crusade brand, there are lots of elements that take a regal tone to them. 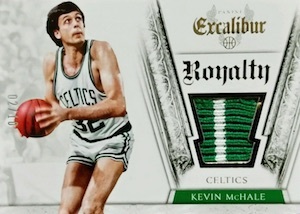 Like 2014-15 Panini Prestige and Threads Basketball, Excalibur has multiple configurations. Each is packaged a differently with its own ratio of autographs and memorabilia cards as well as exclusive inserts. Premium boxes are at the top. These deliver three total hits. Among these are Majestic Marks Signatures, High Praise Signatures, Quest Signatures and Rookie Rampage Duals. All of these are only in premium boxes. Kaboom!, an art-based set that was last seen a couple of years ago, returns in premium boxes. Like they were when they debuted in 2013-14 Panini Innovation, they depict players almost as though they're comic book super heroes. From there, the images are cast against a wild foil background that radiates out like a comic book explosion. Each 2014-15 Panini Excalibur Basketball gravity feed box, the one you find single packs for sale in, have a pair of autographs and memorabilia cards. Orange parallels land one per pack and can't be found anywhere else. It's also the only place to find Knight of the Round inserts, which fall 1:29 packs. Finally, there are blaster boxes. These come with one signed or relic card. A couple of over-sized memorabilia sets, Rookie Rampage Jumbo and Sultans of Springfield, are here. Rookie Rampage also has Prime versions with premium swatches and autographed versions. Blue parallels are also only in blasters. 49 cards. No card for #37 listed. There are gaps in the checklist. 31 cards. Serial numbered #/25. 25 cards. Serial numbered #/349. *Only available as a parallel. 8 cards. Serial numbered #/5. I’m confused… Panini chose to not insert decoy cards into the gravity feed packs, so it’s as obvious as night and day which pack has the Rookie Rampage patch auto, and which pack has the relic. So for $3.50 each, I was able to land: Jabari Parker RPA #/25, Joel Embiid RPA, Jordan Adams RPA #/25, Kyle Anderson RPA, & Blake Griffin Top Flight Patch #/10. Woohoo!!! But this is where it gets good. I just watched a video where 2 guys each opened the new Premium boxes at $110 per box. Neither guy pulled a single autograph… I pulled 4 rookie patch autos out of gravity feeds for $3.50 each and they spend $110 for a patch, relic & points card? Hmmmmm……. 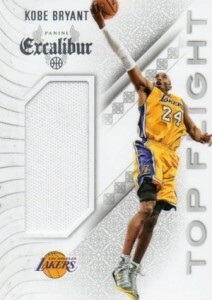 I give this product 5 stars because I can walk into a Target, pack search, and pull a nice hit with no problem. Just today I got a really big Anthony Davis patch, and I hope that they get some more packs in soon. It was the only noticeably bigger pack left. 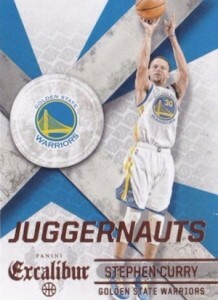 Best $3.50 you can spend on basketball cards, tbh. Not sure what the pack searchers are blathering on about? Anywhoooo… bought two boxes from the local ‘Red WalMart’. Not disappointed in the least. Flipped two of the cards, boxes paid for and cash left over for a few to take a trip to PSA. Nice design. Crisp and clean. FAR exceeds the exclusive Prestige garbage offered last year at Target. You know, the ones that 2/3 of them are STILL sitting there. Waiting to be put in the bargain bin at some point soon?… For good reason. I purchased a Premium box for $72 plus shipping. Overall I was pleased but not elated. Hits were Bill Laimbeer auto, K.J. 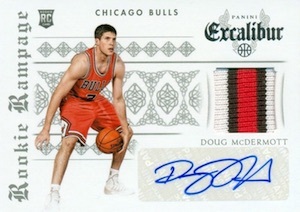 McDaniels dual memorabilia auto, and Mason Plumlee jersey relic. Also got a Derrick Rose Juggernauts #’d/49 and a common silver variant. Got three Crusade inserts, two blue #’d/149 and one red #’d/99. Base cards are rather bland and filled with many little-known players. Inserts look nice, though. Overall I feel like the value of the box was right on par with what I paid, but I purchased the box on sale and if I’d paid any more, I’d feel like the box value was lower. I may purchase this box again if I can get it on sale. Lots of great inserts. Found 2 Kabooms. Great value.